Serves 6. Total Prep/Cooking Time: 1½ hours. I. In Dutch oven, heat 1 tablespoon oil over medium heat until hot. Add veal and garlic (1/2 at a time) and brown evenly, stirring occasionally. Return all veal to pan; season with pepper and 1/2 teaspoon salt. Stir in broth, wine and 1-1/2 teaspoons thyme; bring to a boil. 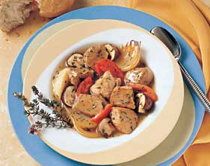 Reduce heat to low; cover tightly and simmer 1-1/4 hours or until veal is tender. II. Meanwhile prepare vegetables. Heat oven to 425¡F. Lightly spray 15″ x 10″ baking pan with cooking spray. In small bowl, combine oil and thyme. Place onions in pan; brush lightly with some oil. Roast 8 to 10 minutes, stirring occasionally. Add mushrooms and tomatoes; brush with remaining oil. Continue roasting 10 to 13 minutes or until mushrooms are tender. III. Stir cornstarch mixture into stew; cook and stir 1 to 2 minutes or until thickened and bubbly. Stir in vegetables and vinegar. Recipe, Photo courtesy National Cattlemen’s Beef Association and Cattlemen’s Beef Board.